Donegal Bay Cycling Club presents the seventh edition of The Donegal Bay Spring Sportive on Saturday. Registration begins at 8.30am and once again there will be three distances on offer with the 140km,100km and 50km routes again taking in the stunning beauty of South Donegal. START: 10 am, Abbey Vocational School, Donegal, County Donegal. Carrickmacross Cycling club hosts their North East Coastal spin on 14th April at 9.30a 45km and 90km routes to choose from. Registration starts at 8.30am ahead of the 9.30am start. There’s food available at halfway and at the finish. 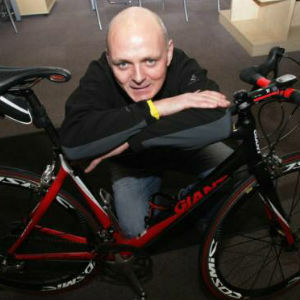 The 3rd sportive event of the year is the 50 mile (80km) Adrian Mullan Foyle Hospice Sportive. This event will raise funds for the Foyle Hospice in honour of our Club cyclist, Adrian Mullan, who was tragically killed riding his bike around his beloved Donegal in October 2015. 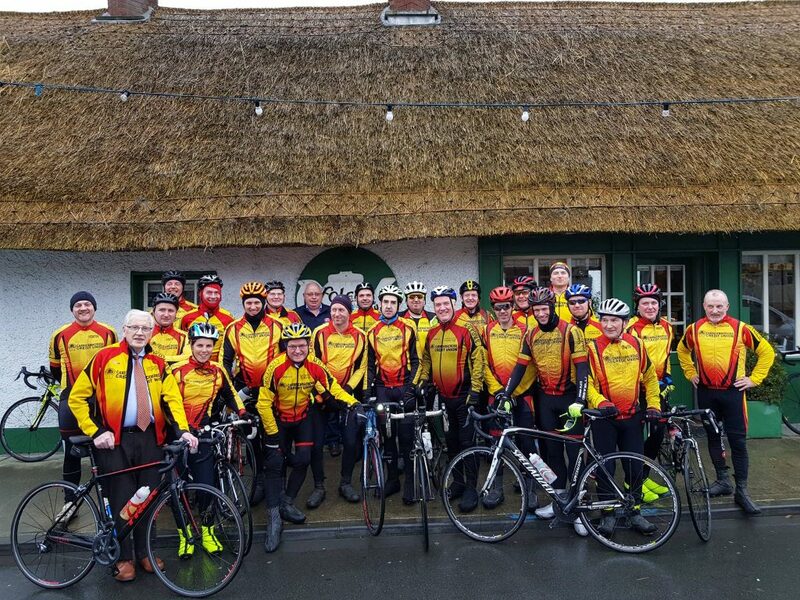 Riders will traverse familiar roads to Buncrana and the North Pole Bar towards Carndonagh. After a brief stop it is on to Gleneely and then the climb towards Redcastle over Cnoc an Uininn (pass the new Spitfire memorial) with a brief stop to honour Adrian. Then it is onto Quigley’s Point towards the Foyle Hospice in Derry for tea, coffee and cakes. START: 8.30am, Templemore Sports Complex, Buncrana Road, Derry. In a busy weekend for Donegal leisure bike riding, Saddle Rock CC present their charity cycle on Sunday. There are 32km and 80km routes available beginning at 9.30am from the Boxing Club in Carndonagh. 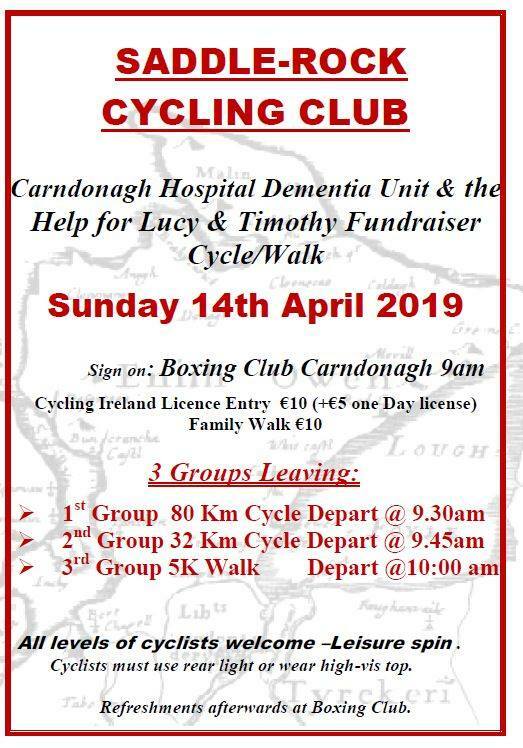 START: 9.30am, Carndonagh Boxing Club, Carndonagh, County Donegal. Sign on begins at 8.15am on Sunday for SMCC Lisburn’s Lagan Valley Challenge. 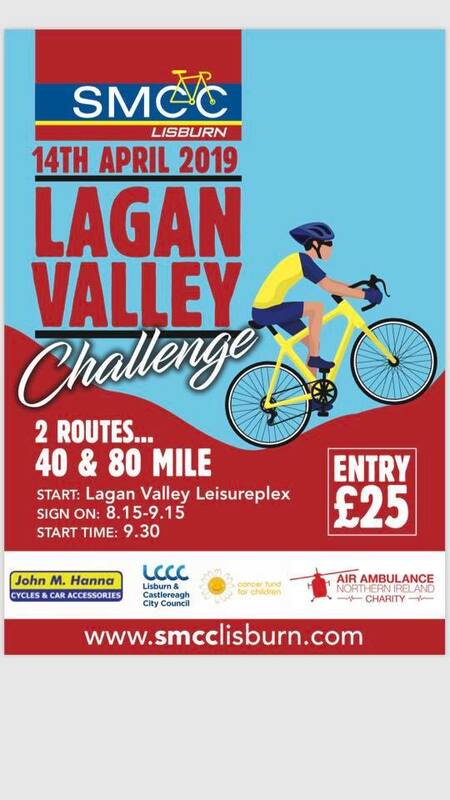 There are 40-mile and 80-mile routes on offer for the event which leaves Lagan Valley Leisureplex at 9.30am. START: 9.30am, Lagan Valley Leisureplex, Lisburn, County Down.